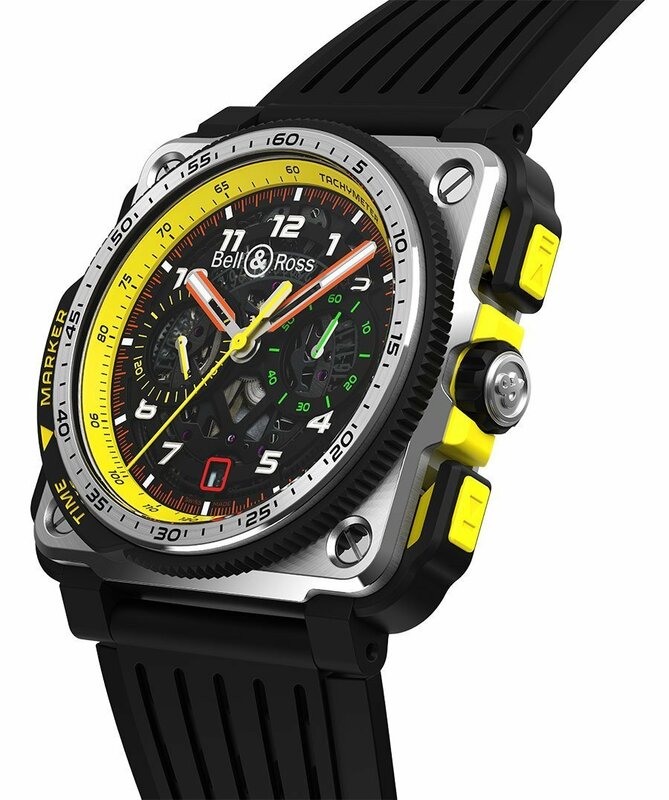 Passion, the forward-looking spirit that has driven Bell & Ross’ growth since 1994, underpins every aspect of the partnership between the French-Swiss watchmaker and Renault F1® Team –now into their fourth year of racing together. Whether it’s taking pole position, or timing a hot lap down to the millisecond, the people behind the cars and watches share a rare af nity. 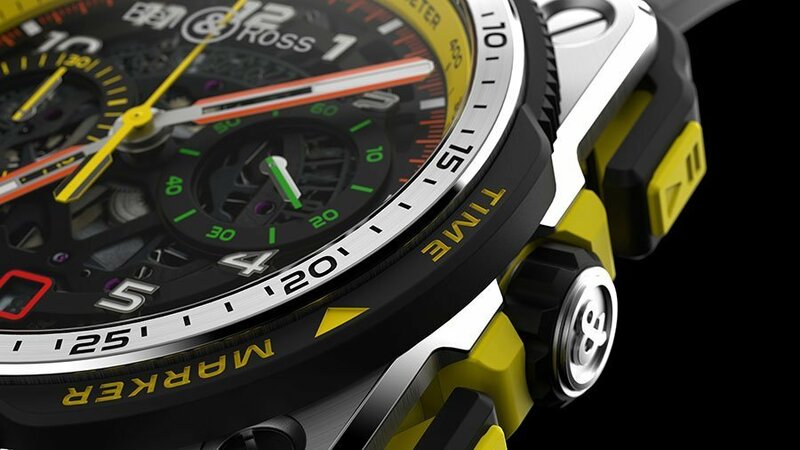 At the respective headquarters of Bell & Ross and Renault F1® Team, two passionate teams are out to conquer time with their precision-engineered machines. The personal and professional stories behind these men of action embody identical values: performance, dedication, technical expertise and courage. Anyone who follows the sport of F1® knows that the winning formula is always teamwork. It takes hundreds of people to get their two men over the nish line, after all, –and the same goes for exceptional watchmaking. Since 1977, as with the centuries- old Swiss tradition, the engineers and designers at Renault F1® Team have sought velocity through mechanical accuracy and collaborative innovation; they share the conviction that every millisecond counts. 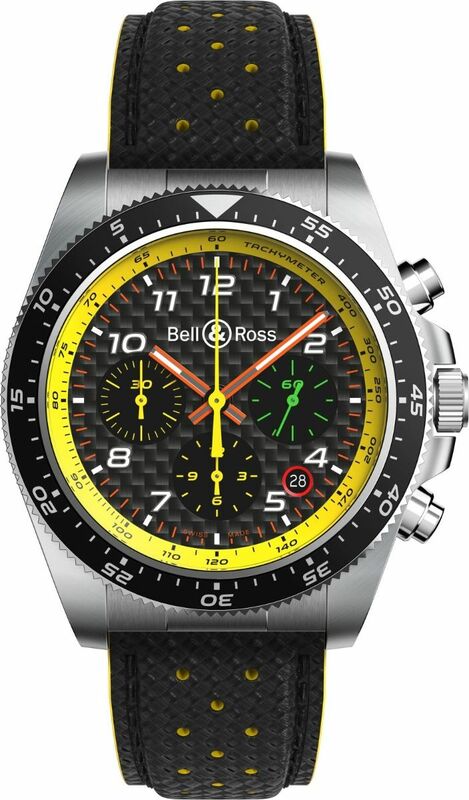 Teamwork isn’t just limited to the individual teams –as Bell & Ross’ R.S.19 watches prove, their respective passion really can cross- fertilize, creating more than the sum of their parts. To celebrate the perseverance, talent and training needed to achieve the highest performance, a team-inspired campaign will accompany the new collection launch. 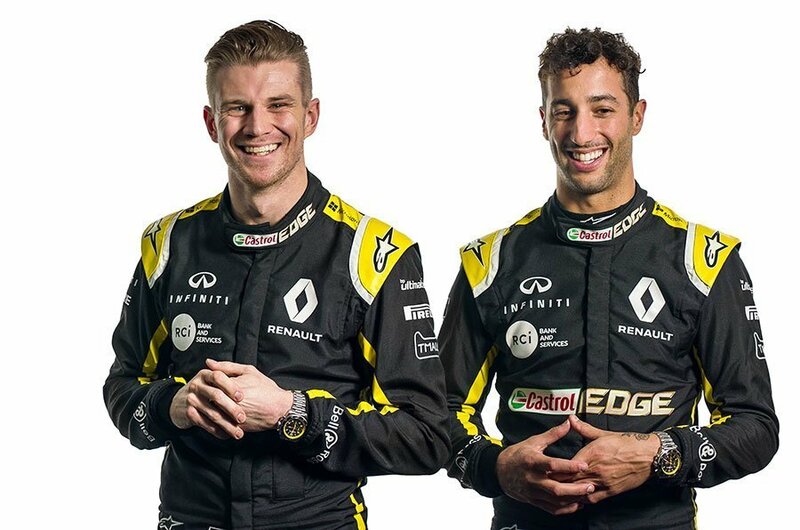 Daniel, Nico and other extraordinary people will walk the public through the life, ritu- als and preparation of both Renault F1® Team and Bell & Ross teams. With 2019’s Formula 1® season well underway, Renault F1® Team faces its most exciting opportunity in years. The talent behind the wheel and the technology being harnessed are unmatched. 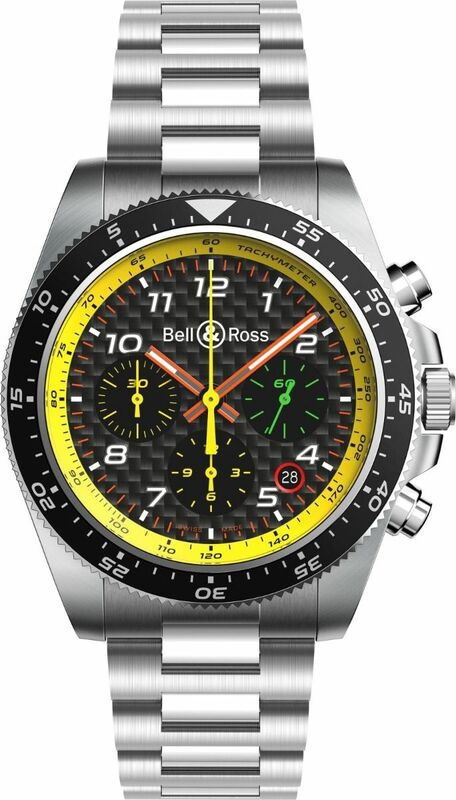 The same goes for Bell & Ross’ R.S.19 collection novelties that are more track-ready than ever. 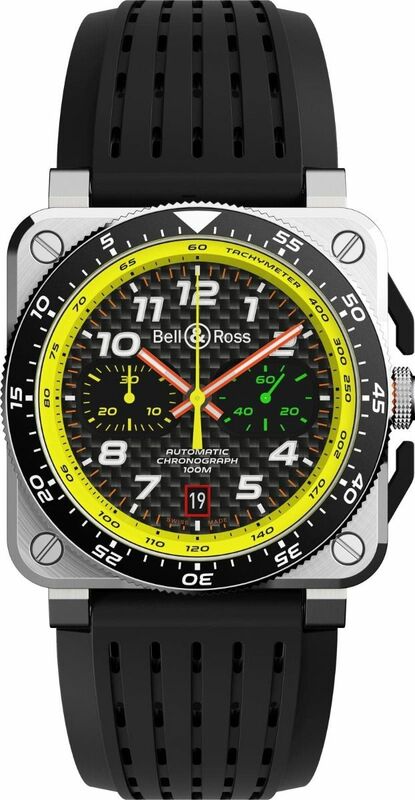 The Bell & Ross R.S.19 collection races ahead with a pair of carbon-dialed chronographs, color-keyed in keeping with Daniel Ricciardo and Nico Hülkenberg’s steering wheels. 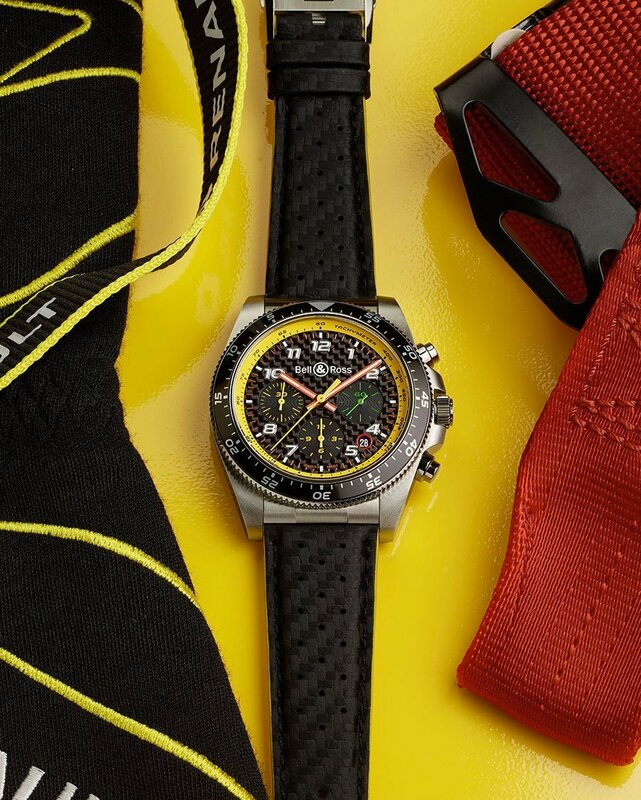 Since the 1960s, the wristworn stopwatch, or ‘chronograph’ has been synonymous with motorsport. Racy aesthetics in combina- tion with precision timing capabilities mean every petrolhead’s hero has worn one. 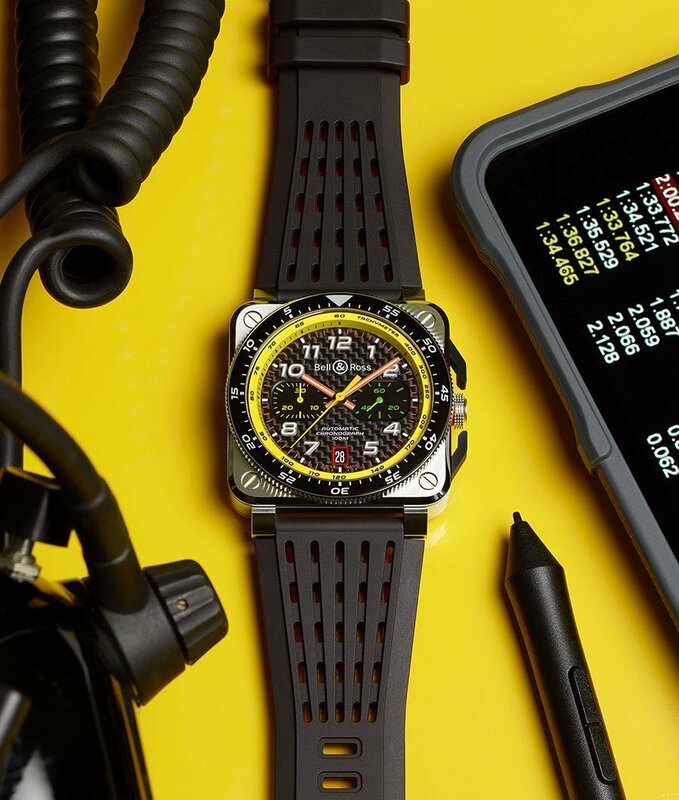 Shaped by Bell & Ross’ expertise in crafting ultra-functional tool watches for professionals, this year’s Renault F1® Team ‘R.S.19’ watch collection is built on two limited-edition chronographs, t for the uncompromising environment of a modern F1® cockpit. The BR V3-94 R.S.19 and BR 03-94 R.S.19 share the same ‘en- gine’ and styling language, yet are mounted on two differing, equally iconic ‘chassis’. The BR V3-94 R.S.19 sports the classic circular case of Bell & Ross’s Vintage collection –now tuned-up to 43 mm ‘XL’ proportions– and the BR 03-94 R.S.19 features the utilitarian 42mm across square of its Instrument watches. The similarities start with the highly legible, luminescent di- als: derived from the Renault F1® Team steering wheel color- coding introduced in the R.S.17 collection. This time however, a dial made of F1®’s essential high-tech material: carbon ber. It provides a sleek background to the signature Renault F1® Team yellow and black colors, plus the green, red and orange found on cockpit buttons. Each model bene ts from a bi-directional timing bezel for ‘on- the- y’ timing, knurled for a better grip while wearing gloves. When things come down to the wire, there’s the high-precision stopwatch functionality of their chronograph mechanics, which can record events to an accuracy of an eighth of a second, over the course of 30 minutes. Designed as a high-octane race car for the wrist, the BR-X1 R.S.19 has been created for fully functional operation at the wheel: ergonomic ‘rocker’ push-buttons suitable for use with gloves, highly legible dial details colored in keeping with Daniel Ricciardo and Nico Hülkenberg’s cockpit controls and extreme lightweight thanks to the combination of grade 5 titanium, ce- ramic and rubber. The square case of the BR-X1 is surrounded by a bumper in micro-blasted ceramic and rubber that acts as a peripheral pro- tective shell. Rubber grip elements have also been integrated into the case to ensure better handling when activating the chronograph’s ‘rocker’ pushbuttons, even while wearing gloves. New to the BR-X1 this year is the addition of a ‘time marker’ outgrowth to the dial’s circumferential bezel ring. 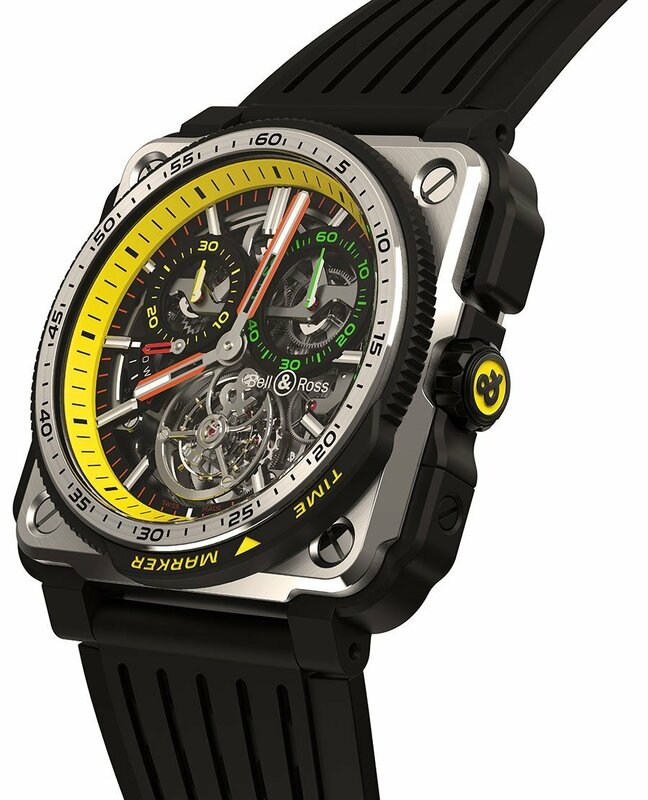 Following a hot lap, the team back in the pitlane can instantly mark wher- ever the chronograph’s yellow running seconds hand has been stopped, by rotating and aligning its yellow triangle. Following a second lap, the respective times can be instantly compared. 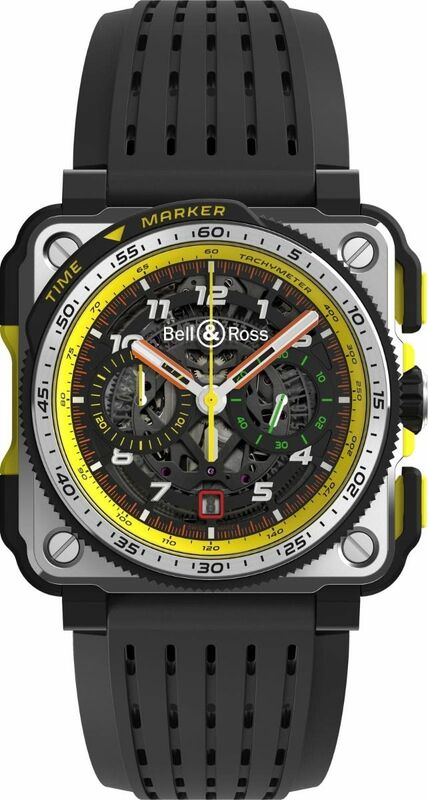 Taking pole position for Bell & Ross and Renault F1® Team’s R.S.19 collection is a miniature F1® engine for the wrist, turbo-charged by a tourbillon. Meaning ‘whirlwind’ in French, the tourbillon is the ultimate tune-up in the high-octane world of Haute Horlogerie –and sure enough, Bell & Ross’ Renault F1® Team R.S.19 collection bene ts from the addition of a particularly sporty example. Whirring the ticking escapement and throbbing balance-wheel around by 360o per minute, the tourbillon cage at 6 o’clock evens-out the pull of gravity across the movement’s regulating parts, improving timekeeping and reducing friction at certain pinch points: an ingenious invention dating back over two cen- turies. Like an F1® engine itself, the manufacturing and hand-assem- bling of a tourbillon cage, with a far smaller balance-wheel to ne-tune as it rotates inside this cramped space, is an extraor- dinary undertaking. The vision is mesmeric, however –a thrilling showcase of ne mechanical watchmaking. In combination with the stripped-back and highly technical case design of the BR-X1, fitted with Bell & Ross’ new lap-by-lap time marker around the bezel and stopwatch chronograph functionality, the R.S.19 Tour- billon is a turbocharged triumph of precision engineering and passion. These exceptional timepieces take the quest for excellence and precision to its apex. 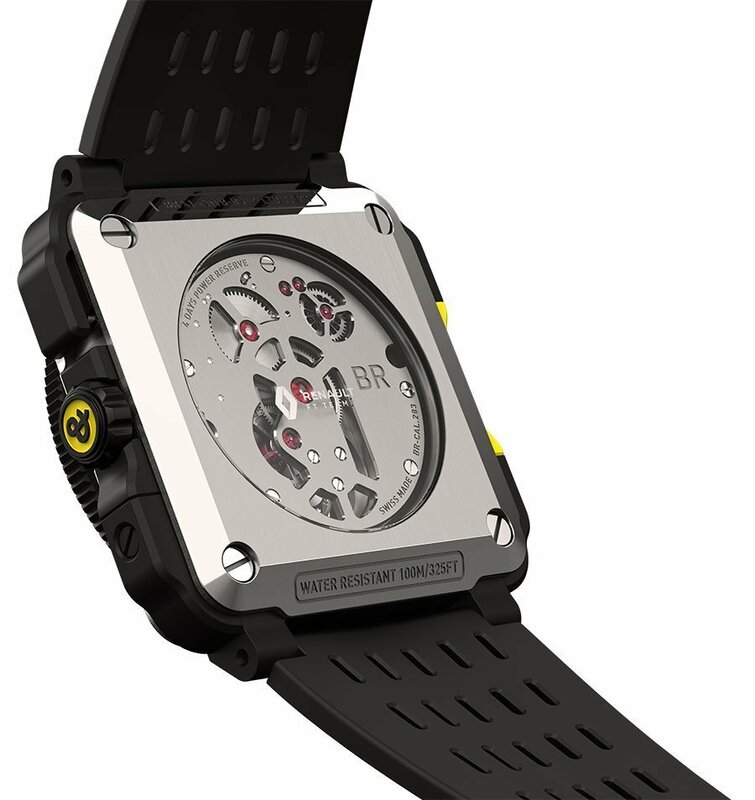 The BR-X1 TOURBILLON CHRONOGRAPH R.S.19 is a limited edi- tion of 20 pieces. Functions: hours, minutes, small seconds at 3 o’clock. Date. Chronograph: 30-minute counter at 9 o’clock, central chronograph seconds. Tachymeter scale on the ange. Case: 42 mm in diameter. Satin- nished polished steel. Bi-directional rotating bezel with anodised aluminium insert. Dial: carbon bre. Metal applique Super-LumiNova®- lled numerals. Metal skeleton Super-LumiNova®- lled hour and minute hands. Functions: hours, minutes, small seconds at 3 o’clock. Skeletonised date at 6 o’clock. Chronograph: 30-minute counter at 9 o’clock, central seconds. Tachymeter scale on the ange. Dial: skeleton. Metal applique Super-LumiNova®- lled numerals. Metal skeleton Super-LumiNova®- lled hour and minute hands. Movement: calibre BR-CAL.283. Hand-wound ying tourbillon. Mono-pusher column wheel chronograph. 282 components, 35 jewels, 21,600 vph. 4-day power reserve. Case: 45 mm in diameter. Satin-polished titanium and matt ceramic with rubber inserts. Rocker mono-pusher. Sapphire case back with anti-re ective coating. Dial: skeleton. Metal applique Super-LumiNova®- lled indices. Metal skeleton Super-LumiNova®- lled hour and minute hands.